Hummingbird Feeder Bats. Bats at your hummingbird feeder. Hummingbird Feeder Bats can be a problem! In the Southwest, (which includes: Southern Arizona, Southwestern New Mexico, parts of Texas, Southern California and Mexico), bats enjoy feeding at hummingbird feeders. Most species of bats in North America eat strictly insects. However, in the southwest there are several species of nectar eating bats. these include the Lesser long-nosed bat and the Mexican Long tongues bat. It is important to know that the lesser Long-nosed bat is listed as critically endangered. The Mexican Long-tongues bat is considered threatened. Like hummingbirds,these bats are also pollinators of important desert plants and are important to the eco-system. How can you tell if bats are raiding your hummingbird feeders? It’s easy because a bat can empty your feeder overnight. It would take hummingbirds several days to empty the same feeder. Bats are nocturnal. This is why these creatures have such a spooky reputation but we need not fear them except in regard to emptying our feeders. If the feeder you filled in the evening is empty in the morning, the problem is bats. Most species of bats eat strictly insects. In the southwest there are several species of nectar eating bats. Hummingbirds and bats are opposites in many ways but both are attracted to nectar. Hummingbirds have no sense of smell but are attracted to bright colors in feeders. Certain bats have an acute sense of smell tuned into the smell of sucrose. One fix to a problem of bats draining your hummingbird feeders is to take your feeders down at night and put them back up in the morning. Hopefully, you’re an early riser because hummingbirds start to feed on nectar about 20 minutes before sunrise. So you need to get up that early to replace your feeders in the morning. 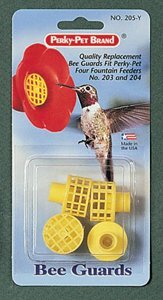 You can use hummingbird feeders with bee guards or attach bee guards to your feeders and sleep in. 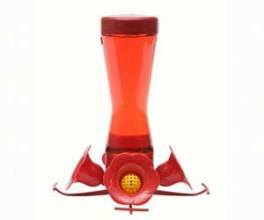 Hummingbird Feeder Bats have a place in nature. All of nature is interrelated, so we do not want to destroy the bats. They are harmless to humans and beneficial to the environment. Like hummingbirds, bats also pollinate flowers and eat thousands of insects each day. We need to look at the "Hummingbird Feeder Bats" place in nature and the problem at your feeders is minor and easy to solve. If you would like to feed the bats as well as the hummingbirds, it's possible. Here is what you need to do: Buy separate feeders for them. These feeders should have a large capacity and large feeding ports. A good example is the Dr. J.B's large capacity feeder. We have been told that if you remove the feeding ports and leave these feeders out all night you can satisfy the bats desire for nectar. Believe us, they will be empty in the morning when you put the hummingbirds out again.